Prominent & Leading Manufacturer from Surat, we offer sample dyeing machine. 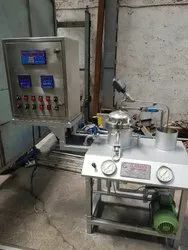 We have all the requisite facilities to manufacture and offer a technologically advanced range of Sample Dyeing Machine / Single Package / Pilot Yarn Dyeing Machine. Manufactured using quality materials, these are appropriate for dyeing of loose fibers, tops, tows, yarn packages and yarn beams with suitable material carriers.